A recent post at Patti Abbott's blog (also the host blog for this weekly tribute to forgotten and overlooked books) asked us which writers' short stories we find ourselves coming back to again and again, or which particular volume we often find ourselves re-reading. I surprised myself when I answered Roald Dahl, a writer who I think was my very first introduction to the strange and the weird in adult fiction. I read him long before I discovered the writers found in Weird Tales. In many ways I think it is Dahl's writing moreso than any other writer that led me at such an early age to seek out the weird and the outré in crime fiction. Most people know Roald Dahl as a children's book writer and creator of fantastic, weird and wonderful characters like Willy Wonka, James and the Giant Peach, the Fantastic Mr Fox. The kid's books have their fair share of wickedness and cruelty as well, but his adult fiction is just as weird and fantastic and lays it on a bit thick in the wicked cruelty department. Those stories introduce us to murderers who escape police detection, greedy gamblers willing to make terrible sacrifices to get what they want, bickering married couples who resort to murder to end their long standing disagreements and intense dislike of each other, and nightmarish inventions that are the undoing of their curious creators. 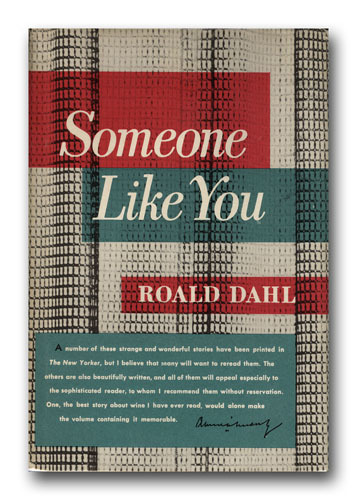 Someone Like You (1953) is only Dahl's second collection of his adult short stories with original magazine publication dates ranging back to 1948, but I think it is his best. Take a look at the table of contents which includes such immediately recognizable titles as "Lamb to the Slaughter," "Man from the South", and "A Dip in the Pool" -- all three having been adapted for television as part of the Alfred Hitchcock Presents anthology series. Dahl more than any other writer is the person whose stories Hitchcock himself directed for the series. 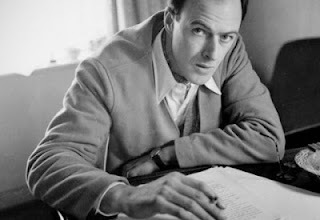 Of the five stories adapted from Dahl's work four were directed by the master of suspense, a testament to the storytelling skill and originality on display in Dahl's writing. Hitchcock was never one to take on the mundane or cliche. In Someone Like You Roald Dahl tries his hand at a variety of genres and moods. While many of the tales involve crime there are also examples of social satire, fantasy, and even two fine stories that could be classified as science fiction. "The Sound Machine" is one of his inventor tales in which a man discovers his machine intended to explore the secret world of inaudible sound has accidentally allowed him entry into a disturbing world of plants he never could have imagined. Among the satires are "Taste" about a wine tasting contest that goes a bit too far and "Skin", a perfect burlesque of art collecting mania and the grotesque extremes one painting enthusiast undertakes to get what he wants. The crime stories are, not surprisingly, my favorites. How can you not get a little thrill out of the cops talking in the kitchen in "Lamb to the Slaughter" or the grisly final sentence of "Man from the South?" I was so enthralled with Dahl when I was a teen I wrote him a fan letter. Though sadly the letter was lost with a lot of other treasures when my parents sold our Connecticut home back in the 1980s I still remember verbatim his curt reply to me. Thank you for your letter which contained many questions none of which I propose to answer. A writer receives many such letters in his life and often cannot take the time to answer them. I am glad you enjoyed the stories. I shouldn't have been surprised that a man who could create such delightfully nasty people would be that brusque with a fan letter from a high school aged American boy. Though I was taken aback and disappointed initially, over time I grew to admire the chutzpah of that reply. Dahl's letter writing has never diminished my appreciation for his fiction writing. I still read his stories. And you should, too. At least once. Great that you got to correspond with Dahl - I used to go out with a girl who loved these dark adult stories and didn't even know he worte books for kids so it's nice to know that not everyone knows him only for his later work (I then introduced her to Stanley Ellin). I used to love watching his TALES OF THE UNEXPECTED series when he introduced the episodes (initially based on his work, then other like Collier and Ellin etc). Have you ever read his fairly ribald late novel, MY UNCLE OSWALD? Love that book. I haven't read enough of these. Like P. G. Wodehouse, Roald Dahl is a complete original. What a thrill to have corresponded with him! Most of Dahl's work is available in affordable editions. From what I've seen elsewhere, John, Dahl's reply to you is typical of his often dryly blunt responses, and therefore to be cherished. Or at least it would be, if it hadn't been lost. Gah! A lot of what I read many decades ago has slipped from memory, but Man From the South will probably be with me until I lose my last marble. John, I for one always thought Dahl was a children's writer and that he wrote YA fiction too. So I'm not at all familiar with his adult fiction. You make a strong case for SOMEONE LIKE YOU which would be a good place to start reading Dahl. His children's books, adorned with bright covers, are popular in India and displayed prominently in bookstores, which might explain why I didn't bother to find out more about his other fiction. His reply to you is priceless. I was blown away reading Tales of the Unexpected back in the 1980s, also as a teen. Never wrote a fan letter though! That's some letter, indeed!